Yesss I'm back on the meal prep wagon! 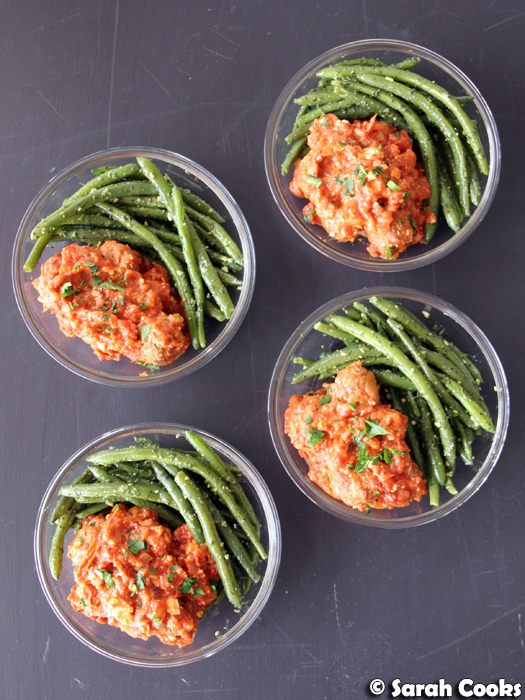 Today's post is low carb, comforting and super delicious. 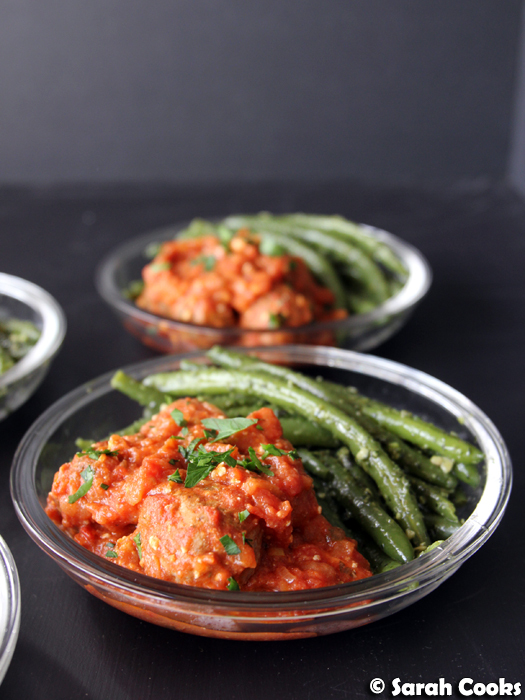 We've got lamb and feta meatballs in tomato sauce, with pesto green beans. Healthy and oh so tasty! Let's start by talking about the beans. Pesto green beans are my new favourite side dish. A couple of weeks ago I had my parents over for dinner. I had grand plans to make Nigella's green beans with pistachio pesto (Nigellissima), to go with some pasta, and a cauliflower salad, but by the time dinner came around I was too tired to do the pesto from scratch. So I just used some good quality basil pesto, and stirred it through some cooked beans. It was super simple, but a total flavour sensation! We all loved it and now I want beans and pesto with everything! (I promise, one day I'll try the pistachio pesto). So, the lamb and feta meatballs. These are a Greek-ish inspired cross between Nigella's meatballs with orzo from At My Table (minus the orzo), and my feta-stuffed Frikadellen. 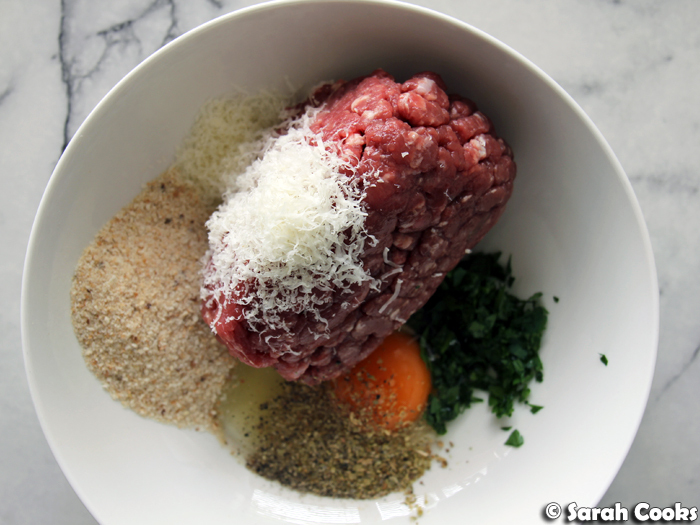 We start with lamb mince, and mix in an egg, garlic, parsley, parmesan cheese, dried oregano, and salt. (I bought this lamb mince from Cannings Free Range Butcher and you can see how lovely it was. And as a bonus, buying mince from a butcher means you can buy the exact amount you want, and aren't locked into a 500 gram packet). You mix this all up, then roll into balls, pressing a little square of feta into each one. It's fiddly but totally worth it. And besides, if your hands are already dirty from rolling the balls, adding the feta isn't really that much extra. 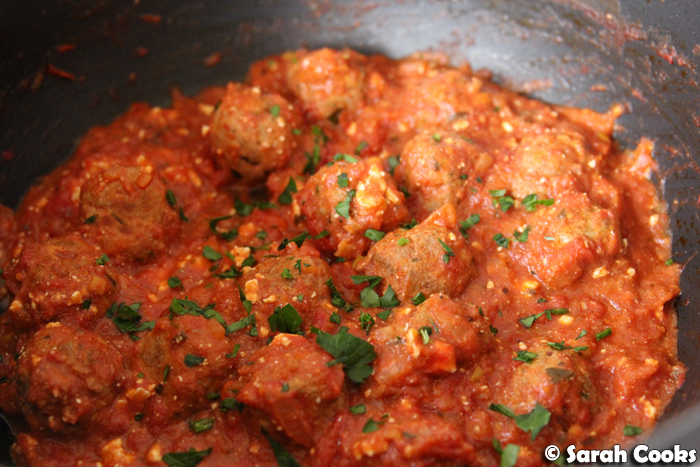 You then make a simple tomato sauce, and simmer the balls in the sauce. If you have any feta cubes leftover, then stir them into the sauce at the end of cooking for extra salty deliciousness. 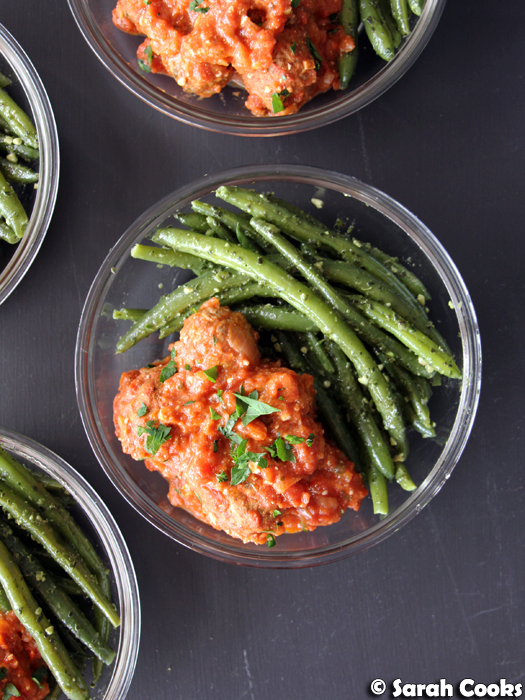 Pop the meatballs, sauce, and beans into your serving containers, and that's it! I found them delicious and filling, but if you have a bigger appetite than I, you could definitely add some pasta or rice to your bowls to bulk them up. But I thought they were perfect just as they were! 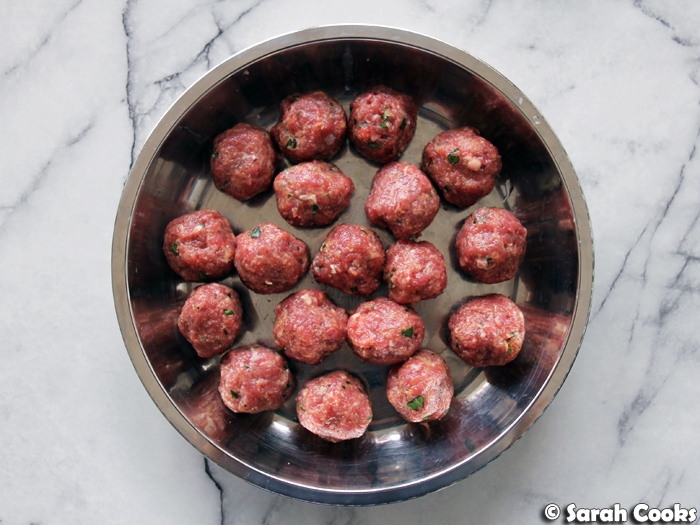 To make the meatballs, place the lamb, egg, 1 tablespoon chopped parsley, garlic, breadcrumbs, Parmesan cheese, salt and 1/2 teaspoon dried oregano in a bowl. Mix well with your hands and form into walnut-sized balls, placing a tiny cube of feta inside each ball as you roll them. You should get approx. 16-20 depending on how big your balls are (heh). Set aside on a plate in the fridge while you get on with the tomato sauce. Heat the olive oil in a heavy-based saucepan, then add the chopped onion. Cook on a low heat for 10 minutes or until softened. Add the remaining 1/2 teaspoon dried oregano and the 1 tablespoon chopped parsley and cook for another minute. Add the chopped tomatoes. Fill the tin halfway with water, swill it around and pour it into the pan as well. Bring to the boil, and simmer with the lid on for 10 minutes. Drop the meatballs in and turn the heat to medium-high. The sauce might not cover the meatballs fully, this is fine. Allow the sauce to come back to the boil, turn the heat down, cover with a lid and cook for 10 minutes. Stir the balls gently, cover the pan again and cook for another 20-25 minutes, or until the balls are cooked through. (Sacrifice one ball for a taste test). If you have any leftover feta cubes, stir them into the sauce now. Allow to cool before decanting to your serving containers. Top and tail the green beans. Cook in boiling salted water for 4-5 minutes or until soft. Drain and rinse under cold water to arrest the cooking process. Place into a bowl, add the pesto, and gently toss with tongs until the beans are coated in the pesto. To assemble the bowls, divide the beans and balls between four serving containers. You're done!